MANAUS, Brazil, Sept. 15 (UPI) -- Brazil has begun construction on a massive steel tower that will rise more than 1,000 feet above the canopy of the Brazilian rainforest near the banks of the Amazon. The observation tower will enable scientists to collect data on greenhouse gases and observe the interaction between the rainforest, river and the changing climate. A collaboration between Brazilian and German scientists, the observation tower is positioned in one of the most remote regions on Earth. The tower is being built with steel sourced from the nearest city, Manaus, which lies more than 100 miles to the south. In recent decades, the proportion of carbon dioxide in the Earth's atmosphere as a whole hasincreased dramatically. Plants, however, need carbon dioxide to grow, and the dense vegetation of the Amazon rainforest has vast quantities of CO2 locked up inside it. The tower will help scientists measure how much carbon dioxide the rainforest absorbs year by year—or how much it releases. Scientists aren't entirely sure, hence the need for this tower. To that end, the structure will be replete with high-tech instruments monitoring air chemistry. But why does it need to be so ridiculously tall? 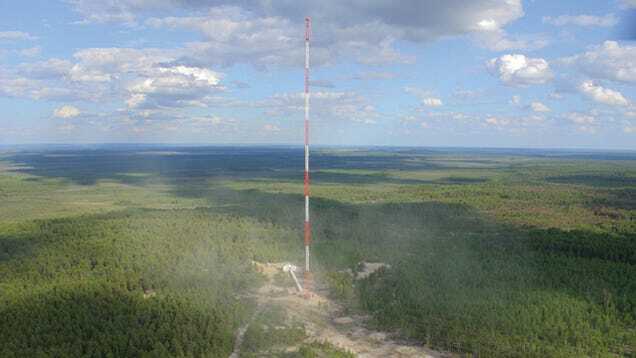 While shorter towers can measure how a local patch of rainforest breathes, this 1,000-foot tower will reach far past the trees, giving an overview of the entire eastern Amazon. "The measurement point is widely without direct human influence, and therefore ideal to investigate the meaning of the forest region for the chemistry and physics of the atmosphere," Jurgen Kesselmeier told the Max Planck Institute for Chemistry. Kesselmeier is project manager for the German contingent. One of the densest regions of forest on earth, and accounting for more than half of all the Earth's rainforest, the Amazon serves an essential role as climate cooling agent -- absorbing carbon-dioxide and replenishing the atmosphere with oxygen. But scientist worry those cooling capabilities are being quickly diminished as the forest is increasingly under threat from development and logging interests. "The tower will help us answer innumerable questions related to global climate change," said Paulo Artaxo, a researcher at the University of Sao Paulo and coordinator for the Brazilian contingent.